Amazon to enter point-of-sale commerce? Web giant Amazon is about to release a mobile-based credit card reader to rival the likes of Square, according to reports on Sunday. 9to5Mac has obtained a copy of a recent Staples (an American office supplies store) inventory, that claims Amazon is planning to launch a device known as the 'Amazon Card Reader' next month. The internal document says the reader will cost $9.99 (around £5.90, AU$10.60), but adds Staples staff are to hold off on making stock available until August 12. For those keeping score at home, this isn't the first time such a rumour has manifested itself. Earlier this year the Wall Street Journal reported Amazon was working on a point-of-sale system. 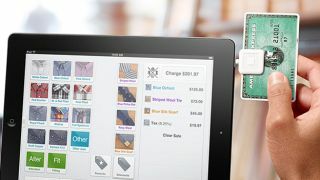 Currently Square, founded and operated by Twitter co-founder Jack Dorsey, dominates the mobile card reader market in the United States, although the PayPal Here rival is also on the scene. Square provides a small, square (hence the name) reader to vendors, who can plug them into a smartphone's 3.5mm headphone jack in order to take credit card payments via an accompanying app. Square takes a small cut of the transaction, but offers a far more cost effective solution for small businesses who don't wish to invest in credit card machines or pay inflated fees associated with them. However, all is far from rosy in the Square garden after it announced losses of $100m earlier this year. Could Amazon capitalise on its perceived weakness? Amazon is yet to comment on the reports, but with August 12 just around the corner, it won't be long until we find out for sure.